We are excited to announce A Personal Choice has contracted with the newest, trendiest hotel in Raleigh – AC Hotel Raleigh North Hills. This hotel is the newest hotel, is located approximately 1/2 mile from A Personal Choice, and is convenient for patients having reversal surgery with Dr. Monteith. The AC Hotel is located in the middle of North Hills Mall Midtown Raleigh and is surrounded by numerous restaurants, shops, entertainment venues, a grocery store, and several pharmacies. Patients having surgery with Dr. Monteith can be assured they will be having the best reversal experience possible. The grand opening of the AC Hotel was March 2017. This new hotel offers Dr. Monteith’s patients a unique combination of quality, timeless European design, comfort and true authenticity. 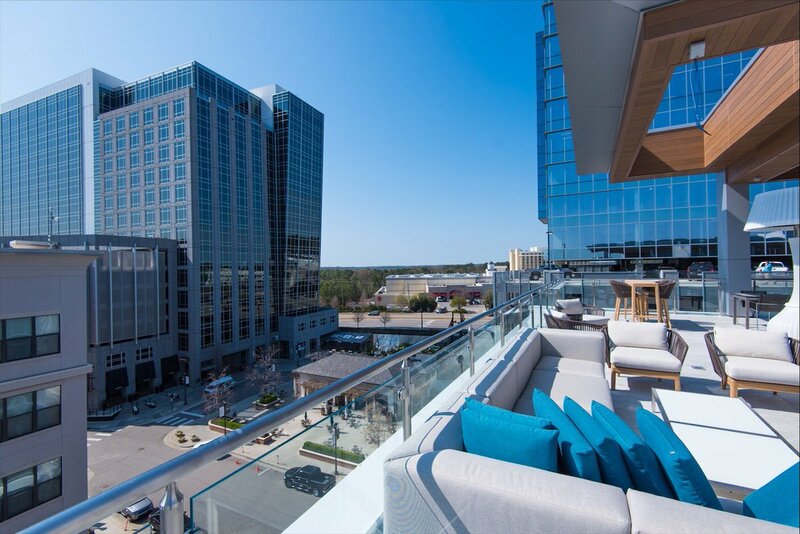 Nestled directly in Raleigh’s bustling North Hills neighborhood, the AC Hotel is in the seat of exciting shopping, dining and entertainment. The hotel has extended a special rate for patients having surgery with Dr. Monteith. This rate is available to patients only at the time of scheduling and includes private car transportation between the hotel and A Personal Choice. At the time of scheduling, patients will be emailed a direct link to hotel reservations to obtain the discounted rate. Enjoy the roof top bar and modern rooms! Enjoy the Level7 Rooftop Bar with Spanish wines on tap, handcrafted cocktails and craft brews overlooking panoramic neighborhood views. Free Wi-Fi, glass enclosed showers, smart TV’s, sleek furniture and premium bedding characterize their rooms. How bad can a new hotel with a trendy roof top bar be? This can be a great place to relax and take the edge of the night before your reversal surgery! When you are considering tubal reversal you will have many different choices about where to have reversal surgery. Most places leave the hotel choice up to you or they make arrangements with hospital-affiliated hotels which are often ‘dated’ and not very nice. We provide a different level of service than other reversal doctors. We have chosen the best hotels at reasonable prices that are the closest to our facility. We have contracted with these hotels to provide good rates to our patients and private car service to our office. Everything you could possibly want or need is within easy walking distance of each of our hotels. Why do we try to give our patients the best experience ever? We want patients to feel special and have a great experience when they come to us. For many of our patients, tubal reversal is a bonding experience with a new partner….or an opportunity to fix a past regret. The hotels where our patients stay is the start of their experience with our surgical center. Many of our patients express how happy they were with their surgical experience. Part of our formula for success is placing patients in hotels that cater to the needs of our patients and provide them with an exceptional experience during their time at our specialty reversal center. My husband and myself have decided that we would love to have another baby. I am 36 years old and I have had a tubal, however I have no clue what kind of tubal that I had done. Is it still possible for me to have this done and be able to get pregnant? We can help you. We can reverse most tubal ligations. My post op report says 50% or half of each tube was “burned”. I was just told by a different facility that because of that I’m not a candidate for a tubal reversal at that practice. Do you perform reversals in such situations? We would consider you a candidate. I would encourage you to send your operative note to us for review. You should consider having our optional screening laparoscopy procedure. This is an additional $1500 but if the tubes are not repairable then you would receive a refund of your surgical fee.